Accompany this colorful cheese terrine with balsamic-dressed salad of frisée, if desired. Line 3 1/2 x 10 inch pâté mold with parchment paper. 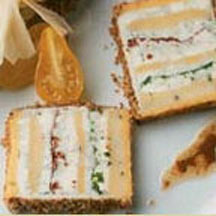 In the mold, alternately layer semi-soft cheese, soft cheese, chopped chervil and finish with a semi-soft cheese layer. Cover and weight down with 1 pound can. Chill several hours. Carefully take terrine from mold. Remove paper. Place on plate. Frost with a thin layer of mascarpone cheese. Combine walnuts, chervil and peppercorns. Press onto sides of terrine. Cover and chill. To serve, put 1 or 2 thin slices terrine on each plate. Accompany terrine with balsamic-dressed salad of frisée, if desired.